“We just want to say thank you for all the wonderful work you do to protect the community like providing security, maintaining law and order and ensuring safety”, were the words of Bishop Kofi Adonteng-Boateng as he spoke in his capacity as an International Police Chaplain in the United States (US) during his visit to the Franconia County District Police (FCDP) on October 20, 2017. 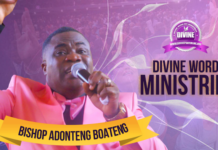 Bishop Adonteng-Boateng was accompanied by members of his church; Divine Word International Ministries (DWIM), said the visit was to express appreciation for the exemplary work the police was doing in the community. He was met by Captain Michael F. Grinnan; Commander of the Franconia District Police Station. The late Friday morning visit by the Bishop was a successful one during which the Bishop flashed back to a September 2016 and 2017 visits respectively to his church by some members of the Fairfax County Police Department (FCPD): “your visits to our church is very much appreciated, so is your work in the community” said the Bishop, who felt this visit was his own small way of making the police know they are appreciated. Commander Grinnan, however, said he couldn’t take credit for everything, saying 2nd Lieutenant Tim Forrest who led the team to DWIM last September, his colleagues who accompanied him, and the entire FCPD is responsible for such professionalism and deserve credit too. DWIM members at the end of the visit were led by the Bishop to pray for the police officers. 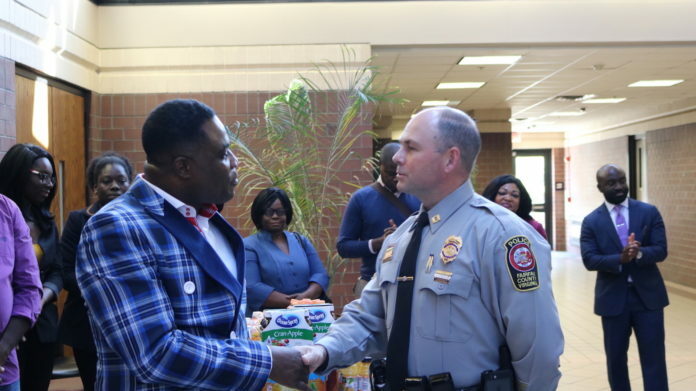 Afterwards, the Bishoppromised the strengthening of his church’s relationship with the FCPD by suggesting the church and police participate in the distribution of items the church is collecting for donation to the needy come Christmas 2017.